Outside in the square a feast with parkin, spit roasts and miniature toffee apples served from the Witches Gingerbread House as a series of characters welcome you to the past. Join us in a Medieval March through the streets of Walsall, led by the Musical Hall musicians The Dead Victorians. Explore the ghosts and dark side of our nature through drawing, puppets, drama and theatre with Pegasus, the travelling Horsewagon theatre. 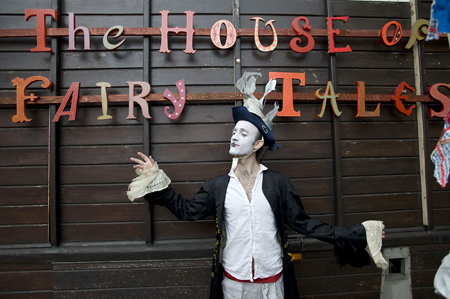 Experience Carnival Games with a twist, treats from The Witches Gingerbread House and Navarac the mirrored caravan. Witness improvised drama and storytelling from the Story Pirates, film projection, potato sculptures with NoNose, the Museum of Prodigies, Live Freak Shows from Mental Floss and Georgina White Aldworth the Visitors From Another Dimension, medieval band Princes in the Tower, folk singers Fanny Feeney with Tudor Ballads and The Marvellous Sam Lee with his old English voice, Zombie DJs, Mexican wrestling displays and Material Transformations from Ian Dawson. Join Matt Harling in his Bubble Dome for mad science experiences, Jim Bond and his Kinetic Ghost Challenge, fortune teller Madame de La Cartomancer and her tarot cards, Sefi the Snake Lady and her snake charming act, burlesque French DJ’s Les Apaches, Marika Rauscher singing Macabre Opera, The Lonesome Cowboys From Hell and their unique Texan Shakespearean stage act. Rhiannon Evans and Liam Ramsden present and gather Herbal Medicine, Folklore for the Ethnomedica project at Kew Gardens and spooky tales of the night with Don’t Tell Stories, courtesy of writer and storyteller Rachel Newsome. Also discover a Surreal installation, from creative arts organisation Container PLUS. Saturday 31 Oct, 12pm – 5pm over a dozen workshops including lantern making, props, costumes, potato sculptures, fortune telling, exploricating, herbalism, freak shows, museums of curiosity. Sunday 1 Nov, 11am – 4pm Gallery Square and various rooms throughout the Gallery itself. Saturday 31 Oct at 6pm, Dress up and join us for a parade with a difference from the Sister Dora statue on the Bridge all the way to Gallery Square. Saturday 31 Oct until 11pm, Gallery Square and in the Gallery foyer, including live stage with bands and performances.